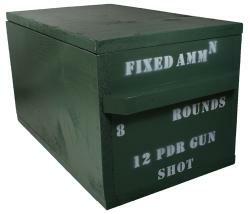 What better way to camouflage your present day items during an event than to store them in ammunition boxes. Ammunition boxes were obviously very common in a Civil War encampment. 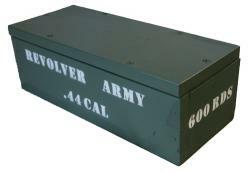 These artillery and cartridge ammunition boxes are designed and made by C&C Sutlery. 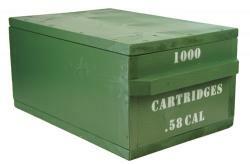 Our ammunition boxes are built, painted, and stenciled as close as possible to the specifications in The Ordnance Manual for the Use of Officers of the United States Army (1862) . However, based upon various research it appears that the wood thickness, stenciling, location of handles, number and type of nails used, and other markings were determined by the arsenal. And often the boxes were unpainted as well. 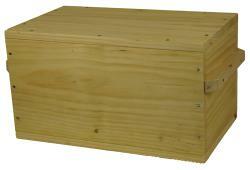 Our boxes are made of pine and crafted with period cut box nails and non-plated slot head wood screws. 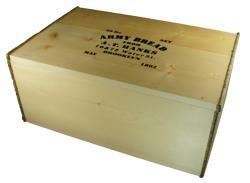 Our goal is to provide boxes that are both historically accurate and as well as affordable. Currently, we have stencils for the following: Allegheny, Camp Floyd (Not an arsenal), Indiana (Not an arsenal), Richmond, Selma, and Watervliet. Others are available upon request. Since each box is custom made to your specifications, please allow 3 weeks for delivery. Additional Shipping charges may be applied due to box size and weight. 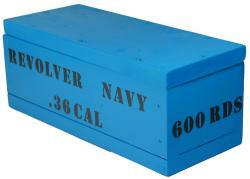 The .36 caliber pistol cartridge box measures 12"L x 5"W x 4.75"H. The interior dimensions are 10.5"L x 3.38"W x 3.38"H.
The US box is painted blue and the stenciling is black. NOTE: Additional shipping charges will be applied due to size and weight of box. 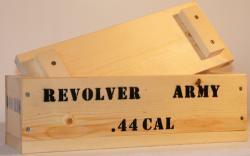 The .44 caliber pistol cartridge box measures 14.5"L x 5.5"W x 5.25"H. The interior dimensions are 13"L x 3.75"W x 3.5"H.
The US box is painted olive green and the stenciling is white. 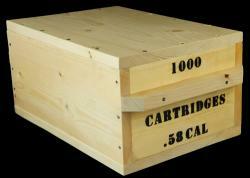 The .52 caliber Sharps Rifle cartridge box measures 16 inches long x 11 inches wide x 8 inches high. Interior dimensions are 14.5 inches L x 9.75 inches W x 6.5 inches H.
The .57 caliber musket cartridge box measures 16"L x 11"W x 8"H. Interior dimensions are 14.5"L x 9.75"W x 6.5"H.
The .577 caliber musket cartridge box measures 16"L x 11"W x 8"H. Interior dimensions are 14.5"L x 9.75"W x 6.5"H.
The .58 caliber musket cartridge box measures 16"L x 11"W x 8"H. Interior dimensions are 14.5"L x 9.75"W x 6.5"H.
The US box is painted olive green and the stenciling is white. Click on the picture for more images. The CS box is unpainted and the stenciling is black. The CS box is unpainted and the stenciling is black. Click on the picture for more images. 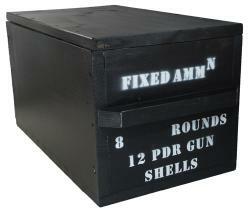 The 12 pound shot ammunition box measures 19"L x 11"W x 11"H. The interior dimensions are 17.38"L x 9.75"W x 9.25"H.
The 12 pound shells ammunition box measures 19"L x 11"W x 11"H. The interior dimensions are 17.38"L x 9.75"W x 9.25"H.
The US box is painted black and the stenciling is white. 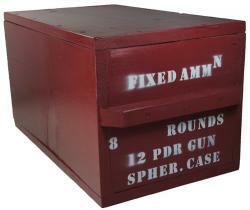 The 12 pound spherical case ammunition box measures 19"L x 11"W x 11"H. The interior dimensions are 17.38"L x 9.75"W x 9.25"H.
The US box is painted red and the stenciling is white. 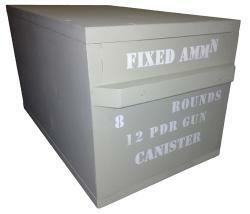 The 12 pound canister ammunition box measures 19"L x 11"W x 11"H. The interior dimensions are 17.38"L x 9.75"W x 9.25"H.
The US box is painted Drab Gray and the stenciling is white. 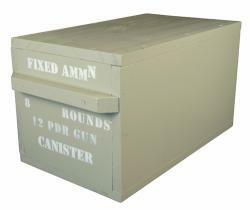 The 3 inch Hotchkiss Canister ammunition box measures 19"L x 11"W x 11"H. The interior dimensions are 17.38"L x 9.75"W x 9.25"H.
The US box is painted drab gray and the stenciling is black. 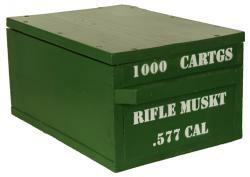 The 12 pound spherical care ammunition box measures 19"L x 11"W x 11"H. The interior dimensions are 17.38"L x 9.75"W x 9.25"H.
The artillery ammunition box measures 19"L x 11"W x 11"H. The interior dimensions are 17.38"L x 9.75"W x 9.25"H. The box is unpainted and is not stenciled. 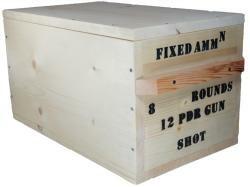 The cartridge box measures 16"L x 11"W x 8"H. The box is unpainted and is not stenciled. The cartridge box measures 14.5"L x 5.5"W x 5.25"H. The interior dimensions are 13"L x 3.75"W x 3.5"H. The box is unpainted and is not stenciled. Click on the picture for more images. 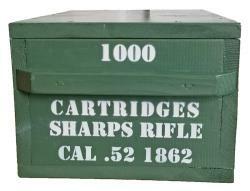 The cartridge box measures 12"L x 5"W x 4.75"H. The interior dimensions are 10.5"L x 3.38"W x 3.38"H. The box is unpainted and is not stenciled. Camp Floyd and the Utah War was used as a strategy by both the Northern and Southern states to divert the nation's attention from states rights and slavery issues. 3500 Union troops, about 1/3 of the entire U.S. Army was dispatched to Utah to suppress a rumored rebellion. President James Buchanan believed restoring order to Utah would unite the Democrats and Republicans and the Northerners and Southerners. John Floyd was the Secretary of War . He and other southern Democrats intended to divert Union troops to the West, deplete the U.S. Treasury by millions of dollars by giving out government contract for the move to southern businessmen, and encourage western support for southern stats rights. Camp Floyd was built in 1858 Fairfield, Utah. The army was recalled in 1861 for the Civil War. There was never a rebellion nor war in Utah. Our hardtack crates are constructed as authentically as possible and still remain affordable. 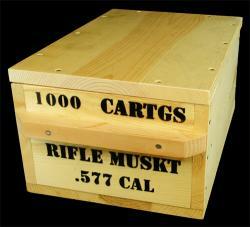 Unlike ammunition boxes, hardtack crate dimensions were not as critical. So long as the box held 50 pounds of hardtack and was about the right size, it was acceptable. Our hardtack crate features two very distinct details: nail holes for the "just opened" look and green sapling strapping. The hardtack box measures 26"L x 17"W x 11"H.
Click on the image for more detailed pictures. The hardtack crate had some specific construction requirements. Per the specifications from Lt. Col. C.L. Kilburn, the Assistant Commissary General of Subsistence, in his "Notes on Preparing Stores for the United States Army and on the Care of the Same, etc, with a few rules for Detecting Adulterations" printed in 1863, under Hard Bread it states: The packages should be thoroughly seasoned, (of wood imparting no taste or odor to the bread,) and reasonably tight. The usual method now adopted is to pack 50 pounds net, in basswood boxes, (sides, top and bottom ½ inch, ends 5/8 of an inch,) and of dimensions corresponding with the cutters used, and strapped at each end with light iron or wood. The bread should be packed on its edge compactly, so as not to shake. Addition specification details were provided in Customs of Service for Non-Commissioned Officers and Soldiers by August Kautz 1864. " When hard bread is put in boxes (the best packages for field transportation), they should be made of fully-seasoned wood, of a kind to impart no taste or odor to the bread, and as far as practicable of single pieces. When two pieces are used in making the same surface, they should be tongued and grooved together. A box 26 x 17 x 11 inches, exterior measure, is an average box for pilot bread, under the usual circumstances of land transportation. The ends of a box of this size should be made of inch, and the remainder of five-eighths, stuff, the package well strapped with green hickory or other suitable wood." Click here to download this manual. NOTE: Additional shipping charges will be applied due to size and weight of box. Shipping is approximately $55.00 per crate.